Leprosy is a medical condition, also known as Hansen's disease, after Armour Hansen, a Norwegian doctor who was the first to view the leprosy microbe under a microscope in 1873. It is neither hereditary nor flesh eating. Leprosy is caused by Mycobacterium leprae (related to the TB mycobacterium). It is probably spread by airborne infection – coughing and sneezing. The first outward sign of leprosy is a patch on the skin, usually associated with loss of feeling. Leprosy is still surrounded by myths, stigma and fear. It was thought that leprosy caused fingers and toes to drop off - it doesn't! However, because leprosy attacks surface nerves in cool spots of the body, your fingers and toes can become anaesthetized - they stop feeling pain. They can then easily become injured through stiffness, cuts, burns and bruises and you wouldn't feel a thing. Infection sets in which results in tissue loss, fingers and toes shorten as cartilage is absorbed by the body and bones become irreparably damaged. Therefore while leprosy doesn't cause fingers or toes to drop off, it is capable of causing disability and even blindness if left untreated. Yes, but it is very difficult to catch and cannot be caught by a handshake. Over 95% of people are immune and after only a couple of days on treatment, sufferers are no longer infectious. Yes! Leprosy is curable with Multi Drug Therapy (MDT), a powerful combination of two to three drugs: Clofazimine, Rifampicin and Dapsone. 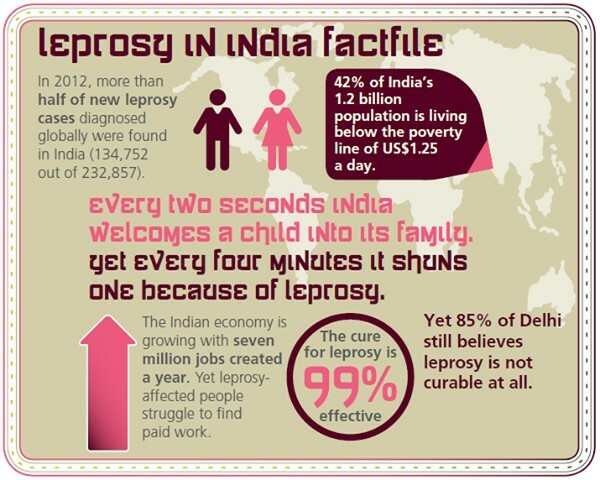 Mild, non-infectious cases of leprosy need treatment with two drugs for 6 months. More severe infectious cases need all three drugs for up to a 24 month period. There is however no effective preventative vaccine - which is why early detection and treatment with MDT are so vital.